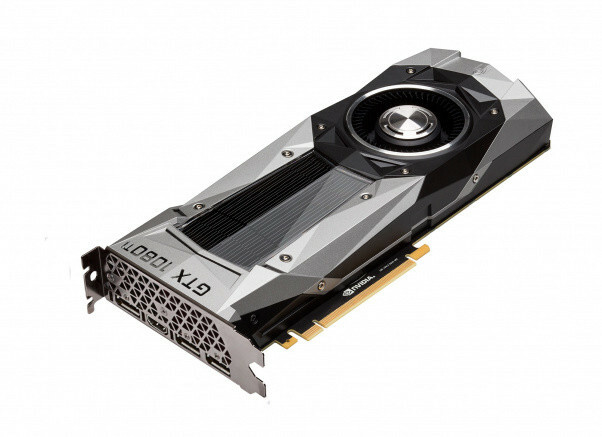 Nvidia officially announces the GTX 1080Ti, Priced at $699! Here we go! The official announcement of Nvidia’s often fabled GTX 1080 Ti is here. The Ultimate Geforce card, as it’s being called penned right now. So what is it packing; 3,584 Cuda cores, 11GB of ddr5x, 11Gbps. It’s a bit odd that it has 11GB of ram vs 12. Maybe because the Titan XP already has 12GB, I don’t know. Spec wise, it’s identical to the Titan XP (Pascal), but has a higher base clock, boost clock and faster clocked memory. It also has a lower memory interface at 352-bit vs the 384-bit of the Titan XP. It’s worth mentioning that Nvidia has done away with the DVI port on the card and looks that only HDMI and Display ports are available. I’d imagine they’ll provide a HDMI-to-DVI adaptor with the card. Reportedly, the GTX 1080Ti is 35% faster than the GTX 1080, which is pretty damned amazing. Looks like I’ll be parting with my GTX 1080 fairly soon. I needs that extra power! The card will be available as soon as next week and is priced at $699, the previous price of the GTX 1080. We mentioned earlier that the GTX 1080 just recently got a price drop to $499 and now we know why.